contact any priest of the Parish. It was not you who chose me but I who chose you"
Has God chosen you for priesthood? The website is a fantastic resource not only for those interested in a vocation to the Priesthood, but also for those interested in fostering vocations to the Priesthood. "Thou Art a Priest Forever"
Congratulations to Rev. 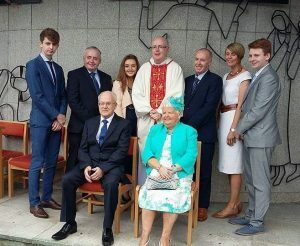 Barry Matthews (Dundalk) who was ordained a priest of this Archdiocese on Sunday 18th June 2017 in St. Patrick's Church, Dundalk. Barry did pastoral placement among us in 2013 and has returned many times. Please pray for him and all our Priests. We ask God's continued Blessings on him. 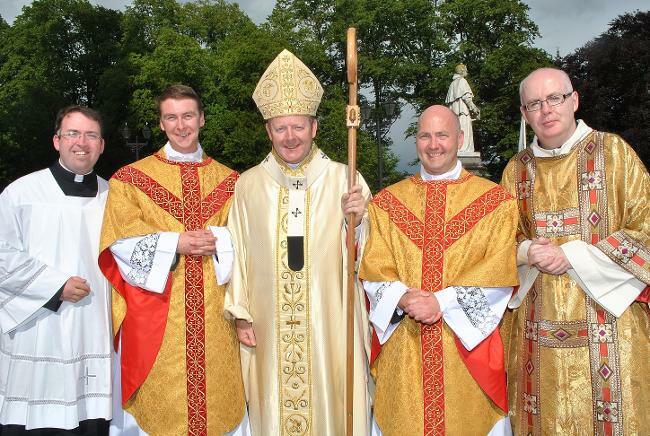 Archbishop Eamon Martin ordained two new Priests for our Archdiocese in St. Patrick's Cathedral, Armagh on Sunday 5th July 2015, Fr Aidan McCann and Fr Brian Slater. Both new priests have worked in our Parish during their training. We ask God's Blessings on them. On Sunday 15/06/'14, in St. Patrick's Church, Keenaught, Desertmartin, Cardinal Seán Brady ordained to the Priesthood Rev. Seán McGuigan of Desertmartin. Fr Seán had been studying for six years at the National Seminary of Ireland, Maynooth and was ordained a Deacon last year. Fr Seán was the second Priest ordained for the diocese this year; Maciej Zacharek was ordained to the Priesthood on Friday 30th May in St. Patrick's Cathedral, Armagh by Cardinal Seán Brady. 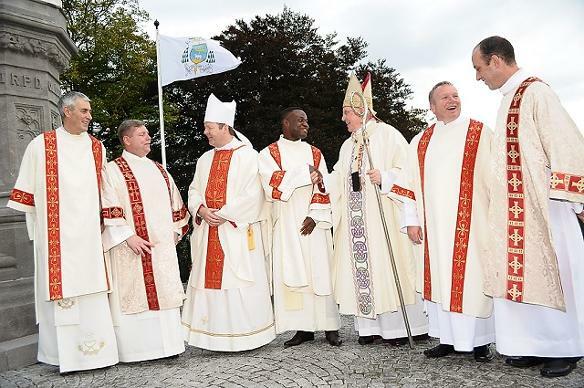 His was the first priestly ordination from Redemptoris Mater House of Formation, a new institution of the Archdiocese of Armagh, located in Dundalk. Maciej originally comes from Wygoda, Poland. We ask God's Blessings on them in their vocations. 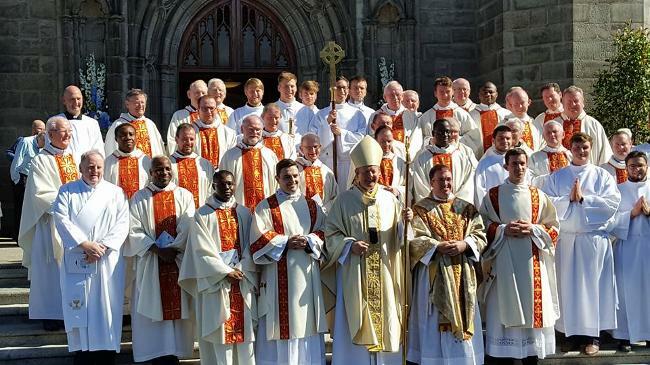 Sunday 29th September 2013 was an historic day in the Archdiocese where the first Ordination to the permanent Diaconate took place in St. Patrick's Cathedral. Five men, having completed three years formation and theological training, were ordained as deacons for service in five parishes in the Archdiocese of Armagh. 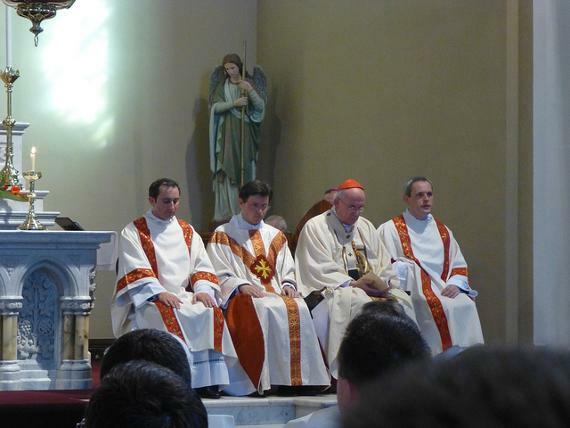 Welcoming the five men into ministry, all of whom are married with children, Cardinal Seán Brady described it as an occasion of "great joy" for Armagh. From now on the deacons will be referred to as "Rev Mr" and they will serve on a part-time basis in their appointed parishes, assisting with baptisms and funerals at the weekends and some administrative duties during the week. Deacons cannot celebrate Mass or hear confession. All five men had to obtain the permission of their wives to go ahead with their studies for ministry. Rev Mr David Durrigan from Ardee who has been appointed to Drogheda. Sunday 30th June 2013 Paul Murphy was ordained to the Priesthood by Cardinal Seán Brady in the Church of the Immaclate Conception, Termonfeckin, Co. Louth. 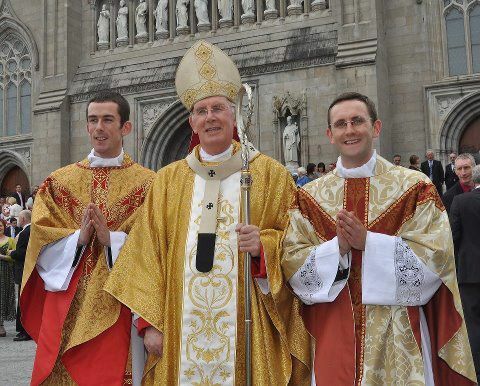 On Sunday 1st July 2012 (feast of St. Oliver Plunkett) in St. Patrick's Cathedral, Armagh, Cardinal Seán Brady ordained two new Priests for our Archdiocese, Frs Thomas McHugh and Ryan McAleer. Both new priests did summer training assignments in Upper Creggan Parish. They ask you to continue to pray for them.